Download PCKeeper Live latest version free. The developers of this application say that PCKeeper Live gathers non-personal system information from your PC and sends it to technical experts who analyze it and detect problems. Introducing PCKeeper Live, a new way to care for your PC. Its unique technology allows real certified technical specialists to spot problems on your PC and fix them remotely. There is a lot of “optimization” software out there that can detect and “fix” a multitude of problems on your PC without significantly improving your performance or your PC experience. In order to get noticeable improvement, you need a real human technician, and no PC software is as intelligent as a real human. That is why we have developed technology that brings a personal PC expert directly to you. With PCKeeper Live, a Microsoft-certified expert will be able to take care of your PC remotely. Thus, sophisticated PC problems, which those other programs fail to catch, can be easily found, and you can get a customized fix solution designed specially for your PC. Unwanted toolbars can change your browser settings, slow down your internet connection and compromise your privacy. 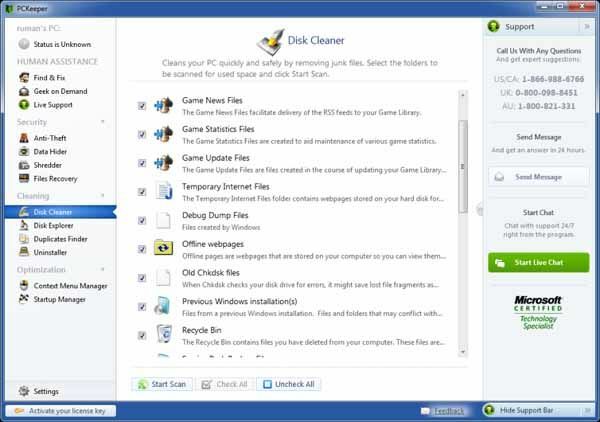 Many PC users are unaware of some of the software that has been downloaded onto their PCs. We identify suspicious programs and submit them for your review. Sometimes firewall settings are changed by malicious applications in order to bypass your PC’s security and hold your PC hostage. Over time, all Windows PCs accumulate dozens of system errors that inevitably cause the PC to slow down. Our technical experts have a fix for each error. Third-party software can harbor spyware, malware and adware. We monitor third-party software installed on your PC and remove detected infections. Websites have many tactics for tracking your online activities, such as storing tracking cookies. We identify and remove these files to preserve your privacy. Windows Registry problems can cause countless different PC malfunctions. We safely correct the most of registry problems to ensure smooth Windows experience. All PCs have junk files, which take up space and reduce performance. We can clean up the junk without harming any of your personal files. If Windows is taking a long time to boot up, it may be because of the many different programs and services that are set to run every time you start your PC. We can help you choose which services you don’t need, so that you can reduce your boot time.